This spring when the trees were fully blooming and the wind came warm off the sea for the first time in months, I was in New London Ct. My annual trek to the Ct. Storytelling Festival http://www.connstorycenter.org/festival.htm I was there to gather in the warmth of story, the exuberance of new and renewed friendship , and the inspiration of hearing the magic that is live storytelling. It was everything I was hoping for and then some. I set aside a small budget for books and items from the sales room and this is where I came across my treasure. Can you imagine having a treasure chest and not opening it for months? Can you imagine the mystery not calling you, the curiosity not beckoning you to pry free the lid. Never again will I be able to ignore the beckoning call of a story not listened too, for the gem I had left to collect dust on the bookshelf was incredible and its late discovery I hope will encourage me to unlock mysteries as soon as I can. It happened like this. At the festival there is a sales room. All the performers have their books and CD’s etc in there as well as a wonderful selection from the Conn College bookstore. Browsing between shows is a chance to savor titles and make out a wish list and for me one or two titles each year make their way home. I carefully pondered the selection this year and made two choices and approached the checkout table. There I noticed a basket with cassette tapes. Remember those outdated items lost in the technology cyclone that has hit us in the last ten years? I pawed through the tapes and came up with three at such a nominal price it seemed to me like stealing! Oh I know they are outdated and do no good in a closet but still I know the work that goes into these projects and was so happy to put my treasures in my take home bag! I came home from the Festival overflowing with excitement, ideas, conversations buzzing in my head, so much to think about. I unpacked and looked at the cassettes and placed them on the shelf with other audio and video. I don’t presently own a cassette player. Ah well one will turn up. Well this was the weekend, I borrowed my Mom’s car to make a trip into Boston, (my car is a story in itself). When I got in I spotted a cassette player, yes they had this car awhile but it is in excellent condition. So I packed up for the day trip to Boston and climbed in toting one extra bag full of cassettes a bit dusty but the anticipation of the 4-6 hours of riding in such good company was high. I slid in the cassette and was swept away. 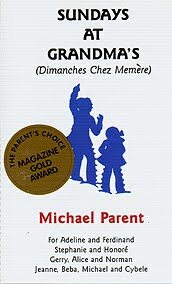 Somehow the miles between Boston and Ct. slipped by amid the rousing French songs and the envisioned Sundays at Grandma’s ( Dimanches Chez Memere) This was my gem, this story of growing up in that wonderful bilingual family of story and song. Here in cassette form, adorned with the shiny gold seal of the Parents Choice Award I was reminded this was recorded a long while back but the story was timeless. Indeed on the cassette is the date 1988, like fine wine a story grows better with age and telling and so this one has come to its maturity and sweeps us back to our childhood memories. Michael Parent opens the door to this tale and you can smell Grandma’s cooking and hear Uncle Arthur’s truck coming down the road. All is not lost for the treasure seekers as the cassette has been updated and is available in CD format on his website http://www.michaelparentstorytelling.com/ or email him at michaelparent@maine.RR.com For me, I will happily keep the gem I found at the festival a reminder to stop and listen and even when technology is pushing us forward remembering to look back, we may have left a gem or two behind.